Happy Friday eve lovelies! Yay for the weekend being right around the corner! Even though I haven't given into anything from the Nordstrom sale yet I did give into the J.Crew Flash sale they did for one day only and I stocked up on these tanks! I've been trying to get more "timeless, adult" pieces in my wardrobe since the trendier pieces tend to come and go rather quickly. These tank tops are so perfect for dressing up and down so I knew they had to be in my closet. This one is a little more "trendy" with the stripes and the neon but I also got it in white and black. A good silky camisole is a definite must have in every girl's closet. I've already worn these camis to work with black pants and a pencil skirt so for this look I decided to keep it casual. I really wanted to show just how versatile these tanks are and since I immediately thought of all the ways I could dress it up I figured dressing it down would be more fun. And let's be real, I love being casual on the weekends any way so this was an actual look I wore when I was on ny great shoe hunt on Saturday. I love that all it would take to dress this cami up would be to throw on some jewelry and a pair or wedges or booties and you're ready to go! Oh and it doesn't hurt that they're currently on sale for $25! Now I just need them to make more colors and I'll be set! friday eve---i like that!! and i like this tank. 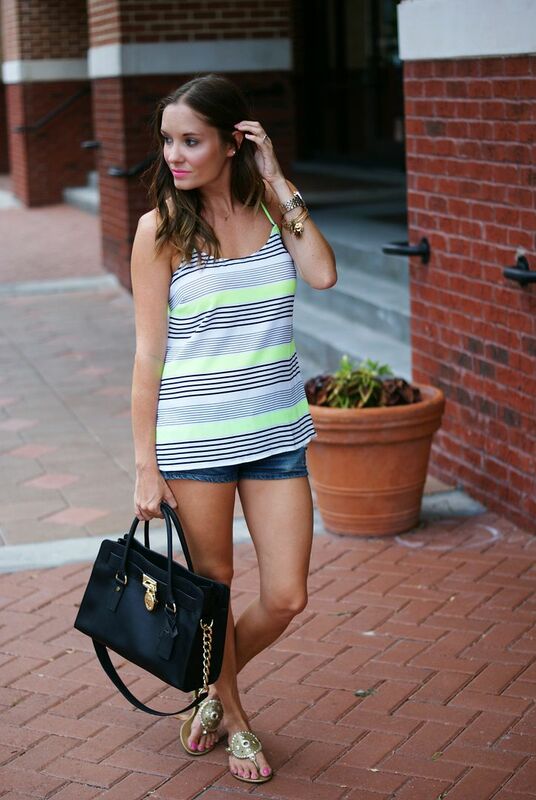 i am on such a huge neon kick lately--love the stripes on your tank. cute and casual. So cute! Definitely a fun color for casual weekend wear, especially during the summer months! I have been all over the j crew sale this week.msuch cute stuff apfor amazing deals. This top is adorable and may need to come live with me too! Neon when you're tan is the best! Of course I also love the navy and white stripes! love the idea of wearing a tank with a blazer and black pants. i'll have to try that! Such a cute tank! I love that you could wear it in so many different ways! Love your sandals too! Silky tanks are the most versatile items. I could totally see this with a black skirt or dressy black skirts. I love it with the denim! Great choice gorgeous! That tank is so cute! Perfect for layering! Love the pop of neon! Adorable! Sometimes horizontal stripes scare me, but these are such fun sizes and the cute is super flattering. I love the fun colors and how you paired it with those shorts. You can never go wrong with denim cutoffs. Your gold sandals and neon-striped tank top are so cute. Perfect casual Summer look! I haven't bought anything from the sale yet either... but only because I'm not a card holder, ha! If you can believe it though, my whole list revolves around the kids. I wish I could say how lame that is, but it's more fun to shop for them anyway, HA! LOVE this pretty tank! The colors, the material, perfection! Love the neon stripes!! So sad it's gone already but I may have to stock up on the black/white - very timeless pieces for a great price! I love this top - neon is so much fun to play with in the summer! Also loving your Jack Rogers! Such a cute top! And I'm loving those sandals! 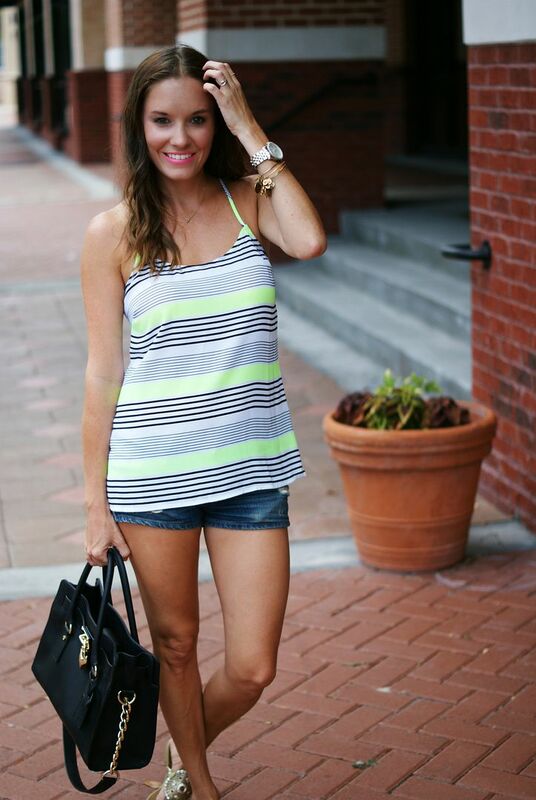 Love the stripes and colors in this cami! You never can go wrong with a chiffon/flowy cami - they are so easily dressed up or down. Good score, girl! Such a cute and casual look which is just my style. Love the sandals too! Love the neon pop of color, so fun! The stripes and bright color combo is great! I always love your style! I love that tank and how versatile it is!!! I just love a fun neon for the summer to kick a punch of color into an outfit. And those shoes are so cute too! Is that really just the medium Hamilton bag that you have? It looks pretty big for the medium. Maybe that is all I need instead of the large. this top sets off your wonderful tan perfectly! Love the stripes, gal! You look fab! Can't go wrong with a little pop of neon for the Summer! Love how versatile this piece is!